It's such fun to be getting all inky, working on two jobs that both require studying 15th century scripts, analysing their neuances to be able to bring them up to date, while keeping true to their origins. Here is the orignal document for the Huguenot museum. I first work with an automatic pen, I love these odd looking pens, but they are great to work with. They give you lovely thick lines, and I tend to tilt on to the edge when I need a thin line. The other commission is for Bar Convent Living Heritage Centre in York. Founded in 1686 as a school for girls. The story of The Bar Convent begins with a secret. In 1686, a time of great danger for all Catholics in England, a woman named Frances Bedingfield purchased a small parcel of land just outside York's walls. She signed the deed under an alias. The ladies who then lived and worked beneath the building's dull slate roof wore slate-coloured gowns, and called themselves the 'Ladies of the Bar'. Nobody knew the truth they concealed. For the early sisters of The Bar Convent, discovery meant punishment - and even death. Over the three centuries that followed, the Community were no strangers to strife. Their home has been at times a school, a hospital ward, a refuge and a bomb-site, emerging into the present day in its current guise: the Living Heritage Centre. Every corner of the building has a tale to tell. Next I work with a quill to achieve flow to my lettering, and this would have been how the original scripts were set down after-all! Legibility is important, but so is the energy of the mark. Quills move across the page far better than any metal nib, giving reign to swirls and flourishes. 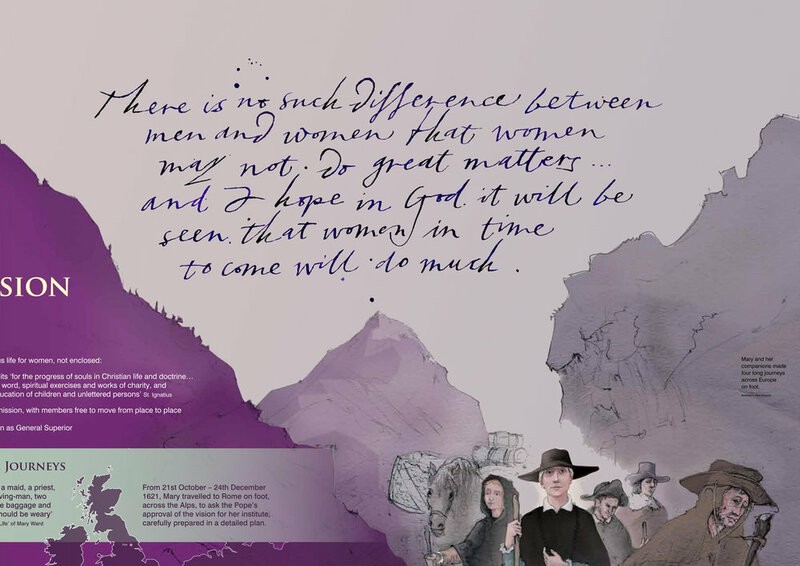 Once I have worked up the quotes and sayings in the style agreed, my calligraphy is enlarged and encorporated within the display panels of the museum. Discover three hundred years of history and the remarkable people who have shaped it. Meet the radical Yorkshire nun and pioneer Mary Ward, whose devotion to her cause took her on foot across the Alps - twice. Learn about secrets and spies, angry mobs and Luftwaffe bombs. Hide yourself away inside a priest hole - then find out how to hide an entire chapel.